This is a Brand New Genuine Konica Minolta HD-510 Hard Disk Unit. 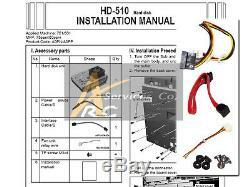 This Kit includes: The Hard Disk Unit Power Source Cable Interface Cable Fan Unit Relay Wire TP Screw M3x4 Installation Manual This item fits these models: Konica Minolta Bizhub 751 and Bizhub 601 Oce VarioLink 7522 and VarioLink 6022 Develop Ineo 751 and Ineo 601 If you have any questions please send us a message! The item "Konica Minolta HD-510 for Bizhub 751 601 Oce VL522 VL6022 Develop Ineo 601 751" is in sale since Wednesday, June 15, 2016. This item is in the category "Business & Industrial\Office\Office Equipment\Copiers\Parts & Accessories". The seller is "arcservicesco" and is located in Burbank, California. This item can be shipped worldwide.